Vision and Learning Problems are Common and Correctable. Did you know... that your child can pass an eye exam or school screening & still have a major vision problem that interferes with learning? Most typical vision exams only check of 20/20 eyesight, but there are other common vision disorders like Convergence Insufficiency, Amblyopia, and Vision-Information Processing Disorder that make reading, learning, and sports seem impossible and make daily life frustrating. Vision Therapy Can Help. Convergence insufficiency is the inability to properly control and coordinate both eyes - Simply put, convergence insufficiency is an eye teaming problem. Eye teaming is the coordinated movement of our eyes - notably, inward when we read or work on computers. When our eyes aren’t working together as a team, we don't see a single image. If our eyes are not "teamed", words overlap, words appear to move, or vision may double. Often our brain may ignore (suppress) information coming into one eye and then we won't see depth or 3-D. 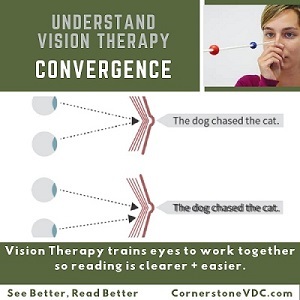 Vision therapy has been proven to correct convergence insufficiency and eliminate symptoms that hold students back from reading. Treating eye-teaming problems involves a series of specialized exercises to train the brain to better coordinate both eyes. 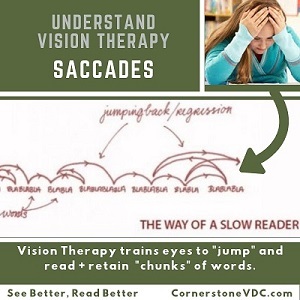 Eye Tracking (pursuits) and Eye jumps (saccades) are critical to reading, sports, and daily life. Eye tracking problems interfere with reading because children's eyes get lost on the page, bounce back or too far forward, or skips lines. 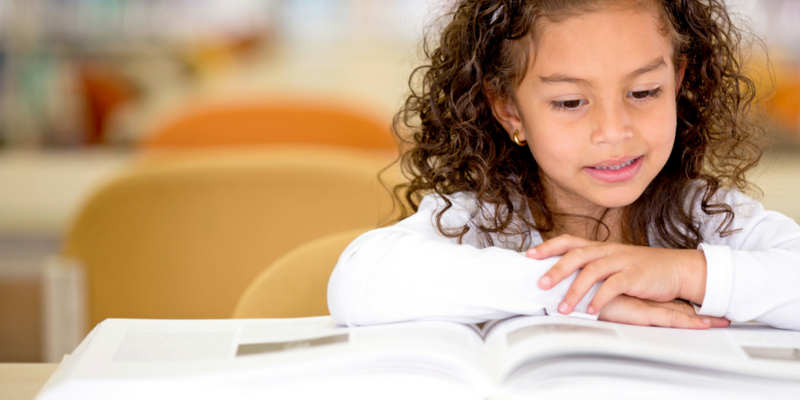 Children will often complain of tired or strained eyes and teachers will notice children reading slowly, have low comprehension, or skip words/lines when reading. Eye tracking problems are also important in sports and games. If your child struggles to catch, hit, or kick a ball or is clumsy when walking or playing, they may have a visual tracking problems. Eye tracking is the first step to success in reading, school, and sports. Vision therapy trains children to direct their eyes together and track objects smoother, easier, and more accurately. After therapy, many patients report that reading is easier and enjoyable for the first time! Functional vision is clear input from our eye and connection to our brain. Visual information processing disorders are when visual information is misinterpreted or poorly connected to the areas of our brain. These brain and eye problems are very common and develop differently in each child, but they are critical because an estimated 80% of classroom learning involves visual learning. Your child can be bright and love to learn, but may have visual processing problems holding them back in school. 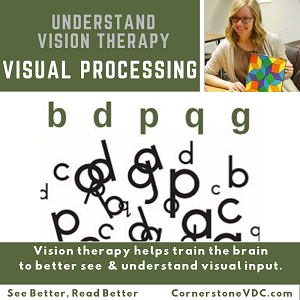 Vision therapy uses specialized and researched techniques to build visual memory, visual discrimination, and visual processing skills to make visual learning easier and faster. Imagine not being able to make words or objects clear. The whiteboard would slowly come into focus seconds after your classmates have already read it. The words on the page would stay fuzzy requiring you to squint, blink, or look way. Clarity and focusing problems (accommodation) are the result of poor ability to adjust the lens in the eye to make words clear. The lens of the eye can be trained to better adjust at near and far to makes words clearer, faster. If your child wears glasses, they may still have issues with adjusting clarity at near and far. Children who struggle with clarity adjustment avoid reading in class, report tired eyes, fall sleep reading, or refused to read altogether. Vision therapy can help make words clearer, faster by training the lens to respond automatically to targets at different differences. 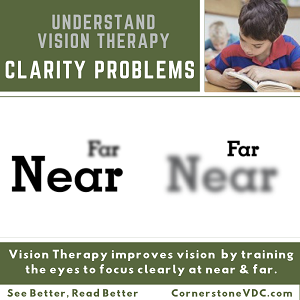 After vision therapy, patients report less headaches and frustration with reading and school work. 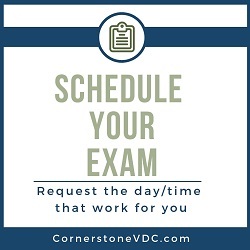 Our comprehensive exam can reveal the hidden vision problems behind frequent headaches, reading/writing struggles, and blurred or double vision. We want to help you see better so you can live better. We will test for eye health, acuity (ability to focus at distance), convergence (ability to turn eyes together), eye pursuits/saccades (eye movements), accommodation (ability to make vision clear), and visual processing (connection between the visual system and the brain).